Yah! 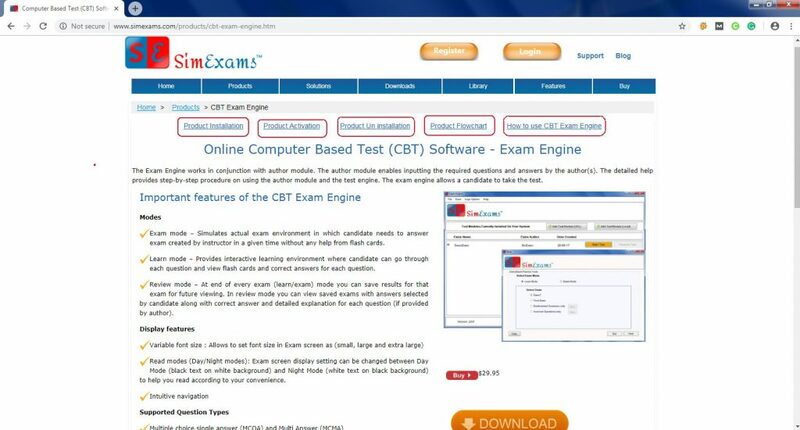 SimExam exam engine page has updated to a great extent and sublimed with design and architecture. Here in this page, we will walk with you to explain step by step procedure from the top like product installation, how to get product activation key, how to use Computer based test exam engine software, and many with spick and span screenshots .one can also see the product flow chart to get a detailed view about the product. Now one can download and install the demo version of exam engine, whereas in demo version one can take the exam up to 10 questions only, and one can get full version by purchasing the activation key. The Exam Engine works in conjunction with the author module. The author module enables the inputting of the required questions and answers from the author(s). This software is rich in feature and easy way to conduct exams. Customize the application to display your own institute logo. Configure exam parameters like number of questions per exam, exam time, pass percentage, allowed exam modes and permitted buttons. Instant scorecard after ending the exam. Save, View and review individual exams with selected answers, correct answers and detailed explanation.